What key does Jack Skellington carry on his lanyard? A skeleton key, of course! Seriously though, Jack Skellington probably has to carry around a lot of keys with him, or at the very least some kind of master key. After all, he's the Pumpkin King of Halloween Town and the acting mayor. He must have keys to various buildings in the town and he's got to have one creepy way to carry his keys, right? What's this? What's this? It's a way to carry your keys with the ghastly style of The Nightmare Before Christmas. 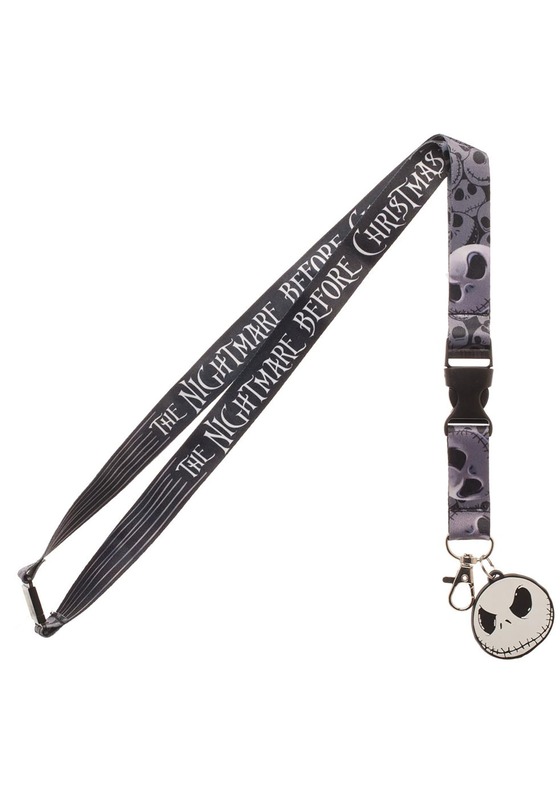 The lanyard comes with a black ribbon that has various images of Jack Skellington on the front, along with "The Nightmare Before Christmas" printed on it. It also has a metal D-ring attached to the bottom, so you can carry all of your keys on it. There's even a Jack Skellington charm attached to it! Lastly, it comes with a card sleeve, so you can use this lanyard to carry around your ID badge for work and special events. It's the only way for a true Night Before Christmas fan to carry around their keys and ID badges, whether for work or for the next convention!